Under Pol Pot and the Khmer Rouge, Cambodia suffered the loss of the highest proportion of its population of any nation in modern history. A study of the actions of psychopathically disordered regimes reveals common features which correspond closely with the clinical symptoms of psychopathy, pathological narcissism and pathological paranoia. By examining the regime of Pol Pot and the Khmer Rouge, we can recognize a number of core features of such psychologically disordered regimes. This in turn can give us some understanding of the nightmarish world they create when their psychology becomes manifest in the societies they control. Pol Pot had a vision for Cambodian society. He wished to see an independent Cambodia which was strong enough to defend itself against its powerful neighbours, Vietnam and Thailand, and able to resist interference from powers such as the United States and China. He wished to see Cambodia develop economically, but he rejected the policies pursued by Soviet Communists, which placed a priority on technology, factories, and urbanization. Instead, inspired partly by Mao, he saw Cambodia’s development as being rooted in the development of agriculture. He also wished to see a country of equals – equals that is apart from the ruling elite. He wished to eliminate the huge disparities that existed in wealth and living standards between Cambodia’s cities and the rural peasantry. And he believed that he alone had the grand design that, when enacted, would achieve these goals. The key clinical feature of psychopathy is a total absence of regard for other human beings. Psychopaths suffer from a major psychological-emotional deficit which renders them incapable of perceiving other human beings as human beings. Instead they regard other people in simple instrumental terms – as being things to be used and eliminated as they see fit. The suffering of others – even suffering on a monumental scale – is of zero consequence to them. This inhuman instrumentalism was evident throughout the years of Khmer Rouge rule. It was evident in the forced evacuation of Phnom Penh, and all the other towns and cities in Cambodia, in which an estimated 20,000 people died. It was evident in the system of forced slave labour that the regime imposed on the entire population. It was evident in the systematic recruitment of children as soldiers, who were taught techniques of torture and execution before they were taught to read and write. And it was brutally evident in the estimated two million deaths that the regime inflicted in less than four years of power. People with paranoid personality disorder are psychologically incapable of seeing other people as anything but a threat. Like virtually every pathological regime, Pol Pot’s Khmer Rouge quickly established a national network of institutions designed to cleanse Cambodia of the enemies within. 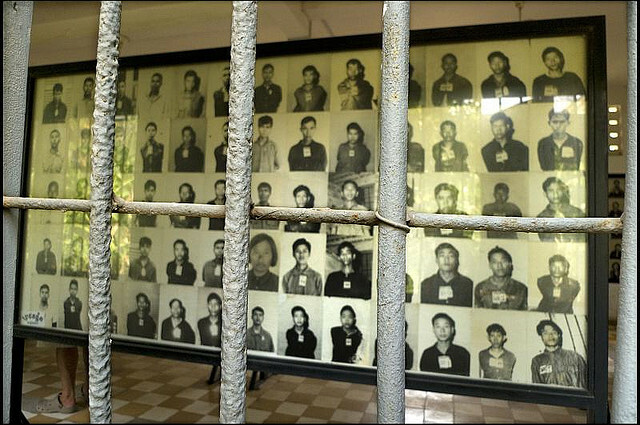 Tuol Sleng, or S-21, the regimes torture centre in Phnom Penh, was one of around 200 such centres established right across Cambodia. Each such centre had its accompanying execution ground, like Choeung Ek, where prisoners were taken after torture and interrogation, to be executed. Many of the torturers and executioners were children. The purpose of S-21, and the other centres like it, was not so much to acquire information as to furnish ‘proof’ which would then be used to justify purges that the leadership had already decided to carry out. The regime’s paranoia fuelled wave after wave of purges against those in the Party, as well as against the general population. Failure to meet quotas for rice production were blamed on saboteurs, who under torture were forced to provide the names of their ‘accomplices’, fuelling an unending spiral of murder. Pol Pot’s vision of absolute equality was never, of course, meant to include the Khmer Rouge leadership. As they transformed Cambodia into a giant rice field tended by malnourished and terrorised slaves, the leaders themselves grew fat. Photographs of Pol Pot, Nuon Chea, and Khieu Samphan show them all as portly figures. As one senior official recalled ‘I never ate better in my life.’ While the population could rely only on untrained nurses injecting coconut juice, the leadership could avail of hospital facilities in Phnom Penh, or travel abroad for medical treatment. New York Times journalist Henry Kamm recounts a surreal encounter with Ieng Sary on a business class flight after the Khmer Rouge regime had fallen. Sary, Kamm reports, took considerable time in choosing among various perfumes, questioning the stewardess about their qualities. Many clinicians have written about the ability of psychopaths to lie convincingly with ease. Everything Pol Pot and the Khmer Rouge leadership said in their public pronouncements were lies. Monumental lies. They lied that Phnom Penh was about to be bombed by U.S. forces to expedite the forced evacuation of the city. They forced confessions from thousands of torture victims, which the torturers themselves knew to be lies. As the country starved, Pol Pot boasted to foreign visitors that malaria had been eradicated and universal literacy had been achieved – in a country where not a school was functioning, (apart, of course, from the schools kept open for the children of the leaders themselves). Rigidity of personality is a core attribute of those with a personality disorder. While people with normal psychology can adjust their behaviour in response to changing circumstances, and as a result of lessons learned, people with personality disorders are incapable of changing their fixed patterns of thinking and behaving. Faced with overwhelming evidence of failure, they dismiss such evidence, and redouble their efforts in the same direction as before. By the end of 1976, eighteen months after the Khmer Rouge gained power, Pol Pot was aware that three quarters of the communes in the country were facing serious food shortages. Rather that consider possible reasons for this – including an overworked and starving workforce for example – he reached the only conclusion his psychology permitted. He concluded that the shortages were the work of traitors and ‘microbes’ attempting to undermine the regime. He then took the only action his psychology permitted. He ordered yet more torture and execution to cleanse the country of its enemies. This post argues that the patterns of thinking and behaving which people with dangerous personality disorders exhibit can be seen clearly in the regimes they establish. These patterns of thought allow us to begin to comprehend the incomprehensible – the total absence of humanity, the unending cycle of torture and murder, the complete lack of concern for the fate of millions which such regimes exhibit. Read more about psychopathic leaders Hitler, Mao and Stalin. This entry was posted in Dangerous Personalities of the 20th Century and tagged Cambodia, Cambodian Genocide, Choeung Ek, genocide, good and evil, Khieu Samphan, Khmer Rouge, leader of khmer rouge, Nuon Chea, Personality disorder, Pol Pot, psychology of evil, Psychopaths, S21 by Ian | disorderedworld. Bookmark the permalink. A really clear and persuasive analysis of Pol Pot and Khmer Rouge. I was aware of the scale of their atrocities but I hadn’t really grasped until now why or what drove them. Excellent analysis! Pot’s a definite psychopath, and behind his blazing promises for a ‘better tomorrow’ were the selfish, unemphathetic needs to acquire more and more power. Sickening. Je vous serais très reconnaissant si je pourrais reproduire votre article Pol Pot et les Khmers rouges.Un aperçu de l’esprit des psychopathes. Nous , khmers ne comprennent pas cette folie meurtrière. Thank you for your message. I would be honored if you did. I think it obvious that the leadership’s psychology is mirrored in the organizational structures they create. What I fail to understand is how the organization itself is able to enact, and in this case tragically and literally “execute”, the leadership’s vision. Where do all the psycopaths come from, in such great numbers, to form armies massive enough to kill nearly 3 million of their fellow countrymen? The only way I can make sense of it is to assume there’s an average percentage of “repressed mass murderers” in any given society who, under the circumstances of war (and/or anonymity), start acting on their bloodthirsty urges. But if that is true, and looking at the sheer size of the khmer rouge army, it would imply that this percentage might be frighteningly high. Does anyone know if there’s scientific data on this?